Tufted Ducks have expanded greatly since our First Atlas – in twenty years the number of tetrads with confirmed or probable breeding has risen from 108 to 171 – and there are now few waters of any size without the species. They were first proved to breed in the county only in 1908, with a slow expansion to 11 sites by 1938. Now, the distribution map shows that they are our second most widespread breeding duck and can be found almost anywhere in Cheshire, although only at a few Wirral sites. 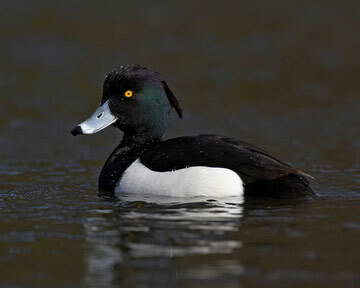 This is one of the few species of waterfowl that apparently thrives on the upland reservoirs of east Cheshire. They need waters with rich bottom mud to provide the ducklings with abundant small larvae and emerging flies (Owen et al 1986). Although this seems like quite an exacting requirement, the submitted habitat codes for this Atlas show birds on every type of aquatic habitat, and it seems that the population expansion has included use of sub-optimal sites including a move onto some very small waters. Most (78%) of the codes were of small waterbodies, lakes or sand quarries, but 18 were described as ponds smaller than 50 m2 (G1) and 17 were on streams, rivers and canals, including even narrow streams and ditches. It is very easy to prove breeding of this species by seeing a brood of chicks, chocolate-brown bundles of fluff, following their mother and diving for their own food as soon as they leave the nest. A surprisingly high proportion of records were sightings of a pair (probable breeding), however, perhaps attributable to fieldworkers not visiting tetrads later in the season after the eggs have hatched. In this late-breeding species, chicks are seldom seen before mid-June. Tufted Ducks are widespread enough to be recorded on a number of BBS transects. The BTO analysis of BBS results shows that the breeding population of Cheshire and Wirral in 2004-05 is estimated at 1,270 birds (with 95% statistical confidence limits of 20-2,530). This figure gives an average of 7 birds per tetrad with confirmed and probable breeding. From reports at well-watched sites there appear to be about half as many broods seen as the number of pairs recorded, perhaps an indication of the level of nest losses. Some large breeding totals have been included in the annual county bird reports: 12 broods at New Platt Wood SQ (SJ77K) in 1994, 10 broods at Doddington (SJ74D) in 1995 and 8 broods at Inner Marsh Farm (SJ37B) in 1997. At Woolston (SJ68P) there were at least 16 broods in 2004, a record 27 broods in 2005 and 22 broods in 2006. Tufted Duck broods typically contain 7-9 chicks, but observers often comment on their rapid depletion, attributed to predators including mink, pike and Lesser Black-backed Gulls.